Tyrant can be advanced only while rezzed and gains "subroutine End the run." for each advancement token on it. Everything about this card suggests to me that it was printed as an inside joke among the designers at Fantasy Flight; this card is anything but tyrannical. For 7 credits, you’ll receive a generous 0 subroutines. 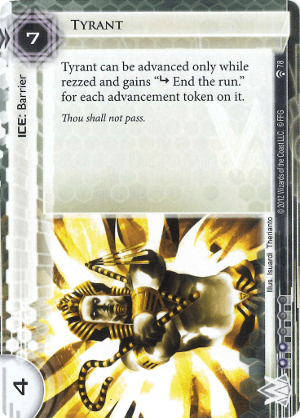 Spending 7 credits on any ice is already a huge tempo hit, but at least the big hitters like Heimdall 1.0 or Tollbooth are taxing enough to be worth their cost. Barring any supporting cards, you’ll have to invest 1 click and a credit (we’re at 9 or more credits now for those keeping track) to be at parity with Bastion; at this point though, you could just stack two Bastions for the same price. Let’s run these cards through the acid (Corroder) test: Tyrant (with one advancement) = 3 credits to break vs. Bastion x 2 = 6 credits to break. This is just unforgivable inefficiency. At least with Woodcutter (another awkward ‘rez THEN advance’ ice) and Corporate Troubleshooter you could theoretically win the game. Back to the joke thing. It’s been a long time since I read the Bible, but didn’t the Hebrews escape Egypt? People saying this card is an inside joke better wake up. Tyrant can be super powerfull in Tennin. Just played a game where i got a Tyrant with 13 advancement tokens and the server just got unstoppable! Combine it with commercialization and you're in for a treat! This can have an advancement (or multiple advancements) on it now when played by using Mumbad Construction Co. if you decide to invest at least 9 credits when rezzing. Same for Woodcutter. Rez Tyrant > Move advancements to Tyrant from Mumbad Co. > ??? > Profit. (I'd rather do it with Woodcutter).